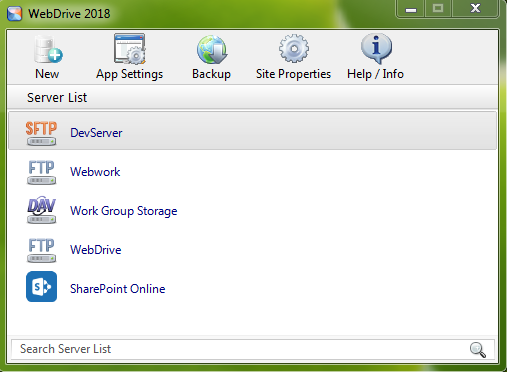 WebDrive's administrator, clutter-free and ready. Comprehensive configuration options for secure connections. Advanced Endpoint Protection - allows you to decide/whitelist which applications are allowed to modify files on your server, protecting you from ransomware and keeping you ahead of security threats. “Shared with me” folders – for Google Drive, OneDrive, and OneDrive for Business allow users to view/edit files and folders that other users have shared with them. FTP resume interrupted download – if connection has been lost during a file transfer, WebDrive can resume from the point where the connection was lost, rather than restarting from the beginning. File caching – WebDrive caches both file and directory listings so you can access your data faster, and it won’t be lost in the event of a failure. You configure file caching and directory listing settings, giving you complete control over how much space is used. Automatically mounts at start up – so there is no need to reconnect each time you restart your computer.